Saturday February 23, 5:30 p.m.- 7:30 p.m.
Monday February 25th 7:00 p.m.- 9:00 p.m.
April 26,27,28 May,3,4,5,10,11,12 Friday and Saturday At 7:30 p.m. Sundays 2:00 p.m.
All Actors Should Be Prepared To Read From The Script And Come Dressed To Move. It Is Not Required But Anyone Wishing To Perform A 1-3 min. Contemporary Comedic Monologue Are Encouraged To Do So. It’s December 20th, 1970, and Elvis Presley has disappeared. No one, not even his wily manager, “The Colonel”, knows of his whereabouts. 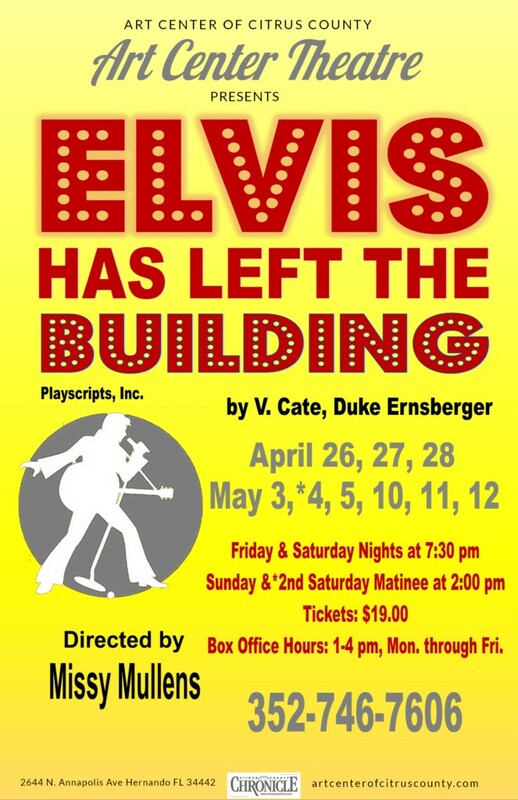 But the Colonel is all shook up because he has racked up a secret debt — and with the King himself missing, the only way to pay it off is to find an Elvis impersonator within 24 hours. Hijinks ensue as the Colonel takes desperate measures to replace a man who is irreplaceable, all while keeping the prying eyes of a nosy reporter at bay and figuring out what happened to the real Elvis. Elvis’ Manager He Was An Outsized Mystery Man Who Went By The Name Of Thomas A. Parker And Insisted Upon Being Called “The Colonel.” Always Playing The Part Of The Southern Gentleman, He Was A Shrewd, Showman-Like Figure Who Learned How To Sell An Act By Working For Carnivals; Age 60-70 But Actor Can Be Aged With Make-Up. This Role Has A Heavy Line Load The Colonel is on Stage For The Entirety Of The Show. This entry was posted in Art Center Building, Auditions, News on January 15, 2019 by Art Center.